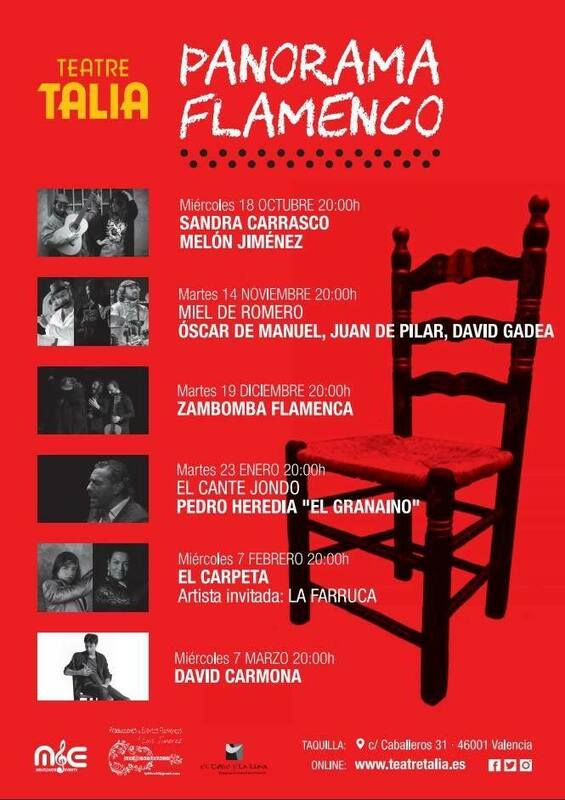 The Teatre Talia launches a new proposal to publicize the current FLAMENCO PANORAMA with a wide range of figures. The singer Sandra Carrasco and the guitarist Daniel “Melón” Jiménez will perform from the stage of Talia from October to March, who interact in a recital of cante and toque. Rosemary honey with the flamenco guitar of the purest lineage of Juan de Pilar, the rhythmic rhythm of David Gadea and the flamenco flute of Óscar de Manuel. La Zambomba Navideña, El cante jondo by Pedro Heredia “El Granaino”, El Carpeta with guest artist La Farruca and will close with David Carmona which is contributing powerfully to give a new and wider vision of the flamenco universe, in whose orthodoxy and purity Forged studying with Manolo Sanlúcar.